Signals of Spring students have always done amazing workusing Earth imagery to track the movements of animals. Here, a few students share some of their findings. At Evanston High School in Evanston, Wyoming, Dr. Clarissa Cole's students Niki, Brandon, and Kate made some startling discoveries about the Polar Bear! After learning how to analyze NASA Earth imagery through Signals of Spring, the students made some incredible findings. The students explain, "One of the victims of global warming is the Polar Bear. Our teacher, Dr. Cole, showed us an article by National Geographic that pointed out that because of melting ice, the Polar Bear is having to hunt farther and farther away from land. As the ice closer to shore melts, they are traveling closer to danger. We then got onto the Signals of Spring site and looked at the maps. Sure enough, the bears are traveling farther north and farther from land in order to keep hunting. If you will look on the site maps, this fact is provable and very clear. Our program backs up the assertions being made." Click here to see the Polar Bear Temperature Map. Dr. Cole's students think that programs such as Signals of Spring are the answer. They said, "It is being predicted that Polar Bears may disappear completely in the next 50 years as a result of melting ice. Many are falling through the ice as they continue to hunt farther from the safety of land. Ice is thinning and they fall through." "Perhaps the work of Signals of Spring can actually help scientists at USGS to track the Polar Bear and in some way help to prevent their extinction. They are now listed as a 'threatened' species as a result of thinning ice and declining numbers. We can provide a means of letting people know what is happening so that we can change their future and our own." Click here to see the Northern Goshawk maps. 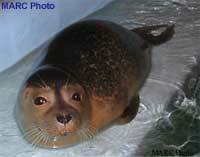 When we first started tracking Marc the harbor seal, we saw no great movement from his location. Now, since the water is warming up, we have noted that he had been going more to the East, away from shore. Then, about two weeks later, he came back to where he was originally. I think his migration is like the narwhales, because they travel only a few hundred miles away from where they usually subside. He also had been noted on the tracker that he had been on the land for a little while. While I know this is common for seals but it seemed odd at first to see this huge cluster in the water and then, one marker on the land far from the others. I believe that the harbor seal may have migrated out southeast to the Gulf Stream current for it is warmer there. He had started migrating further away when it was winter, when we had a long cold snap. I think that he had gone out there because the Gulf Stream current is from tropical waters and the water here in NJ and up in Maine where the seal is, in the winter, is pretty cold. This led our group to believe that he went there either because of his food source went there or because he wanted to go to warmer waters. Follow the link above and zoom in on Maine, and it shows what I am talking about. Signals of Spring allows students to integrate the concepts they learn in class, those that are covered in science textbooks. The process by which a teacher can bring the issues that animals face is an exciting process, and students excel in their science investigations as a result.